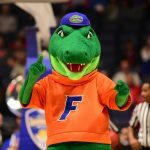 Florida Gators basketball (5-1) suffered its first loss of the season on Friday in a 77-72 defeat at the hands of the No. 11 Gonzaga Bulldogs (5-0) in the second round of the 2016 AdvoCare Invitational in Orlando, Florida. OnlyGators.com breaks down Friday’s loss below. It was over when … Redshirt junior center John Egbunu‘s fourth block of the game bounced off the backboard and into the hands of Gonzaga forward Zach Collins, who laid it in to put the Zags up six with 1:09 to play. What looked at first to be a play that could quickly switch momentum in Florida’s favor did the opposite as it snuffed out the Gators’ last true opportunity for a comeback. Significant stretch: Florida led by as many as 11 points in the first half but led by just five at the break. With the Gators’ in a scoreless drought (4:19 without a point, 5:03 without a basket), the Bulldogs took off on a 15-2 run to complete a 20-point swing and take nine-point lead. It was UF’s largest deficit of the season and one it was never able to rebound from. Exceptional efforts: No one was particularly “on” for Florida, though junior forward Devin Robinson got off to a hot start with UF’s first nine points of the game. He scored 13 points on 5-of-9 shooting in the first half but went 1-for-4 in the second half and missed all three of his attempts from beyond the arc. Robinson still led the way with a game-high 18 points — due in large part to making all six of his free throws — with five rebounds. Egbunu was perhaps even more of an X-factor for the Gators as he not only forced Gonzaga’s big man to foul out, he made half his shots, hit 4-of-5 free throws and grabbed a game-high seven boards in addition to his four blocks. Significant stat: There’s been a concentration on free throw shooting this season for Florida, and the improvement was more apparent than ever Friday as the Gators hit 22-of-24 gimmies. The problem? Florida struggled to find the bottom of the basket when not at the line. UF hit 24-of-65 field goals (.369) and 2-of-19 threes (.105) on the evening. To put that greater perspective, the Gators took seven more shots than the Bulldogs but made six fewer. What it means: The loss itself is no big deal for Florida in the long run, though it was certainly a blown opportunity to pick up a neutral-site win against a ranked opponent earlier in the season. Even if the Gators close the AdvoCare Invitational with a win, it may not be enough to get them in the AP Top 25 for the first time this season on Monday. Up next: Florida will play its final game of the AdvoCare Invitational when it faces Miami on Sunday at 4:30 p.m. in what should be an even matchup.